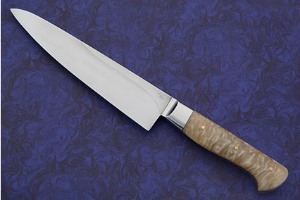 Petit gyuto hocho, meaning "small slicing knife", are perfect general purpose kitchen utility knives. The 6 inch, slender blade makes it very useful and versatile from slicing fruit to chopping garlic with enough belly to really get serious slicing done. 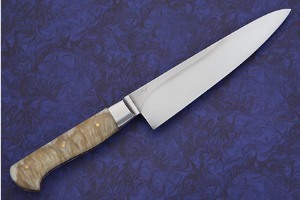 The thin blade produces a very clean, even cut without bruising the food being sliced. 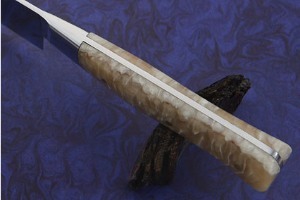 The handle is formed from extremely rare high Arctic muskox horn. 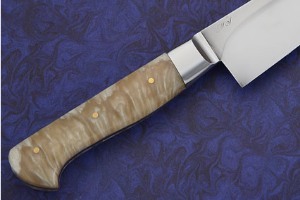 Musk ox horn is one of the most rare and majestic handle materials used in the knife world. The highly polished horn has a unique grain structure that immediately grabs the eye. It is nicely carved to swell toward the front of the handle, move into a slimmer waist and finally to swell again at the beak at the end of the handle. Muskox horn is a perfect choice for use in either a home or commercial kitchen. 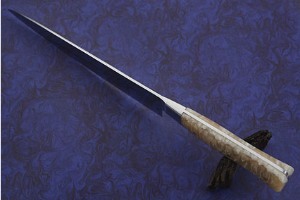 The bolster is formed from 416 stainless steel, pinned and soldered to the blade for strength and durability. 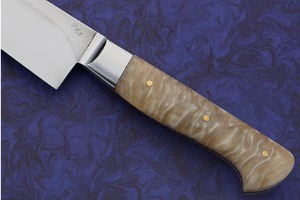 The knife has perfect balance and feels exceptional in the hand.